It’s hard to put into words how to describe each of Wings’s pieces. First, they are not simply jewelry, they are art. And they are art that contains the power to soothe, balance, put right discordant souls. I am blessed with the privilege of sharing many of Wings’s pieces in my home or worn on my being, but this bracelet never comes off my wrist. It makes me feel fulfilled in spirit… and whole. In its physical existence, I constantly receive compliments from others. 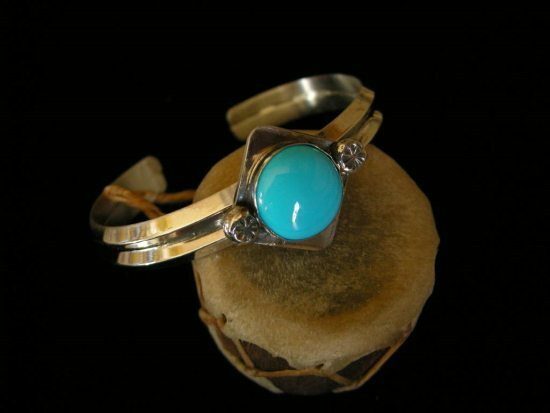 It’s a stunning piece with a stone of that reflects a clear perfect blue sky. Photo, work, and work title copyright Wings and Aji, 2016; text copyright Susan, 2016; all rights reserved. Nothing herein may used or reproduced in any form without the express written permission of the owners. Posted on Friday, February 5th, 2016 at 5:44 pm. Filed under: Client Testimonials Tags: Client Testimonials	RSS 2.0 feed.